​​If you're looking for a large lot, an oasis style backyard, RV parking, peace and quiet and a rural feel but close to town, then stop the car, this is the one! Turned into a paradise by it's current owners, outdoors this property is spectacular with a pebble-tec saltwater pool and spa, putting green, fire-pit, built-in BBQ, covered patio, low maintenance landscaping, fruit trees and RV Driveway/parking area that's almost 200' long. 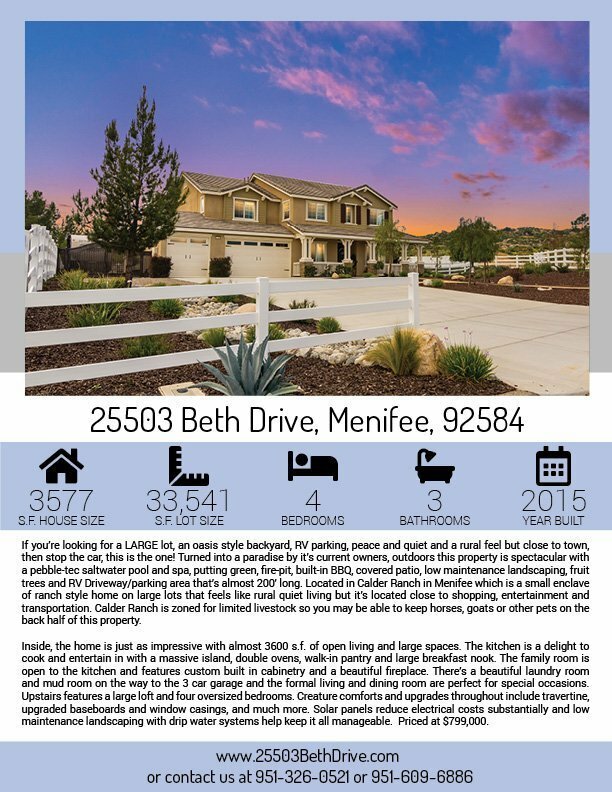 Located in Calder Ranch in Menifee which is a small enclave of ranch style home on large lots that feels like rural quiet living but it's located close to shopping, entertainment and transportation. And Calder Ranch is zoned for limited livestock so you may be able to keep a horse or two on the back half of this property. Inside, the home is just as impressive with almost 3600 s.f. of open living and large spaces. The kitchen is a delight to cook and entertain in with a massive island, double ovens, walk-in pantry and large breakfast nook. The family room is open to the kitchen and features custom built in cabinetry and a beautiful fireplace. There's a beautiful laundry room and mud room on the way to the 3 car garage and the formal living and dining room are perfect for special occasions. Upstairs features a large loft and four oversized bedrooms. Creature comforts and upgrades throughout include Travertine, upgraded baseboards and window casings, and much more. Solar panels keep energy costs down and low maintenance landscaping with drip sprinkler system help keep it all manageable. 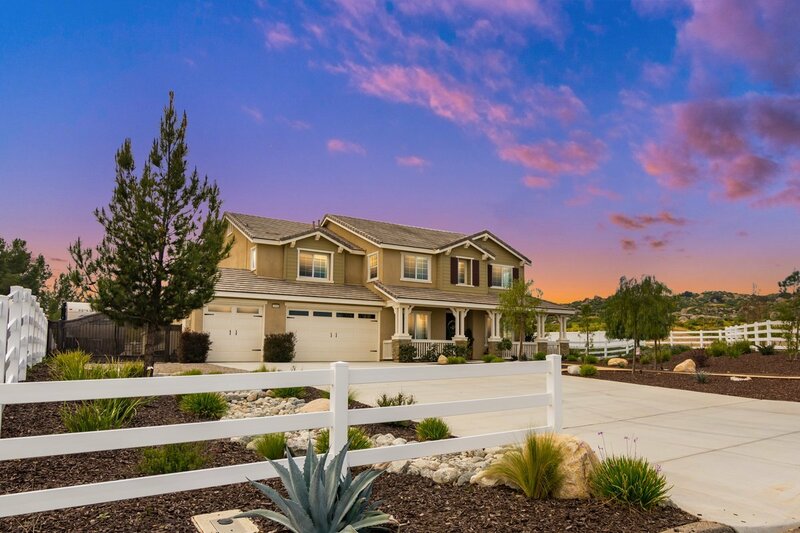 ​Located in the ​community of Calder Ranch with larger lots and homes ​close to shopping, transportation, and medical. Calder Ranch also allows for horses and limited livestock. 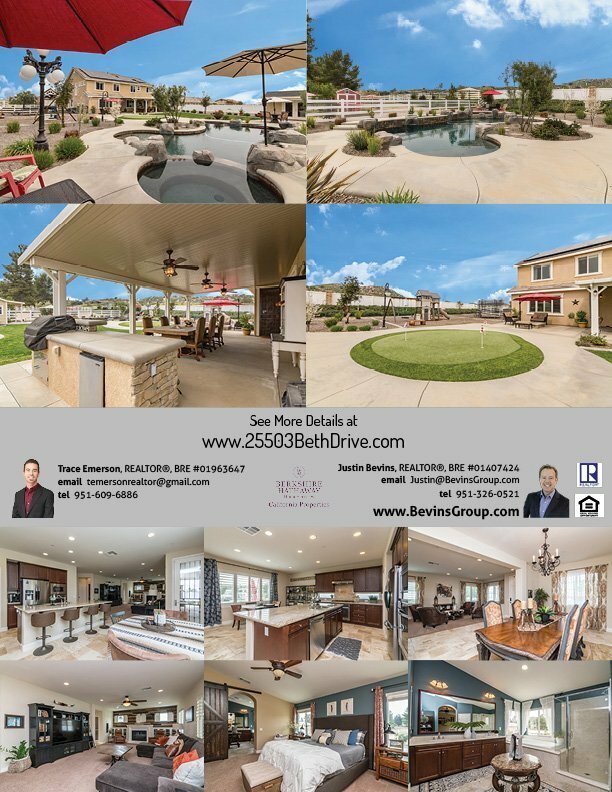 ​​For additional information, current pricing, or to schedule a private viewing of this beautiful home, please contact us via text or phone at ​951-326-0521 or 951-609-6886. You can also email Justin@BevinsGroup.com for more information. ​Thanks for contacting us to schedule a showing of this awesome home! ​Please fill out this short form and we'll get it set up for you or you can call/text us at 951-326-0521.